Fireburst brings a interesting concept to the racing genre, but ultimately falls short due to numerous bugs and poor map layout. Fireburst is a paragon for how a unique and terrific concept can be spoiled with bad execution. Like your traditional racing game, the player competes against NPCs or other players to be first across the finish line. However, there is an additional twist. All vehicles possess a boosting apparatus that shoots fire in all directions. This mechanism can also be used to destroy opposing vehicles that are in the line of fire. However, holding down the boost for to long can result in an overheat of your vehicle, blowing it to pieces. Unfortunately, the numerous amount of bugs and the poor layout of maps render the game nearly unplayable. At the main menu, the player has the option to play on the single or multiplayer modes, and may also toggle through the options and leaderboards. Single player offers a variety of game modes which include Quick Race, the Fireburst Racing League, Custom Race, Destruction, and a tutorial. 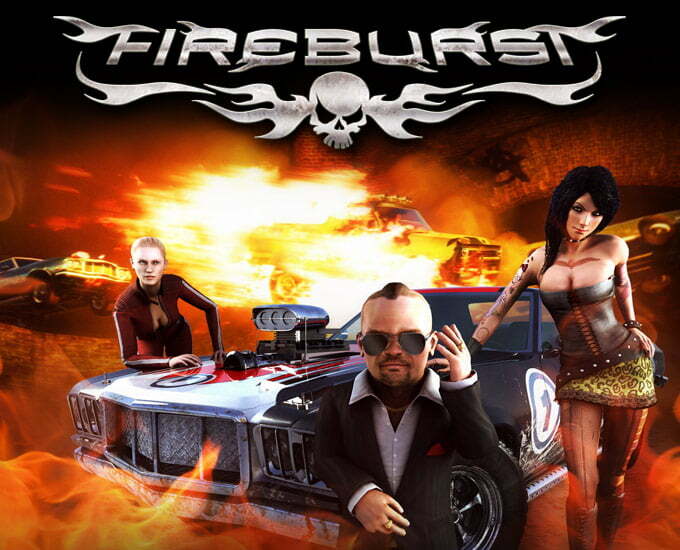 Fireburst lacks a campaign and any story whatsoever, but are instead replaced with the game’s Fireburst Racing League. In this mode, players are given challenges to beat, in order to unlock new characters, cars etc. Many of these challenges were frustratingly hard, and retrying over and over again is only entertaining for so long. And don’t get me started on the destruction mode. The only person who gets hard playing destruction is Michael Bay. In this game mode, players aimlessly drive around an inclosed circle and attempt to destroy opposing vehicles using the boosting mechanism. What may sound like quality entertainment is actually empty action with a lack of initiative. I unfortunately did not have the opportunity to try Fireburst‘s multiplayer mode, because literally NO ONE else was playing. I stood 15 minutes in a public game lobby and not one player joined. The multiplayer did also have a split screen option, which I suppose would be rather fun with a few buddies to play with. I read online that many people ran into many glitches during the racing and while booting up race events. My initial experiences with Fireburst were bug free, and wasn’t until deep within the Fireburst Racing League. Many times I would be faced with the situation where my vehicle spawned in an immovable area. I grew increasingly frustrated as the opponents flew past me, and I was faced with one option only: restart. Once in a while, I would also closely pass by objects, and be instantly blown back by some invisible arm, blowing my vehicle to smithereens. This situation is very difficult to avoid since Fireburst is an extremely aggressive and fast paced racing game. The track layout didn’t help the situation either. I couldn’t help but notice the maps were very inconsistent. At one moment, the track would be wide open and then at the next be very narrow obstacles to avoid. Consequently, running into the walls are inevitable at times. Fireburst is nothing visually spectacular, so do not be misled by XBLA’s description of the graphics as being “fantastic”. The screenshot above, which is the picture used by XBLA is nothing like the actual graphics. They are, in reality, quite grainy and textures lack quite a bit of detail. I also noticed that all explosions are the exact same, no matter what car or how serious the explosion. Whether this was an act of laziness by the developer, indiePub, or a way to keep production costs, I don’t know. Anyway, I must not be too critical because it is an arcade game. Fireburst is not a disaster to look at but it is very forgettable. The soundtrack for Fireburst was very fitting for the game I suppose, which varied from hard-punk rock to alternative. Although these genres are not my first choice when it comes to music, it is bearable. As for the voice-overs, I reckon they were offensive to certain demographics and were quite difficult to ignore. I understand they were part of the games charisma, but the casual gamer may not. A good example of this is the character Hanako, an adolescent Oriental school girl. Her character seems very stereotypical and is extremely irritating to listen to. Fireburst brings a interesting concept to the racing genre, but ultimately falls short due to numerous bugs and poor map layouts. Certain game modes may be entertaining in groups, such as the split screen multiplayer. The screenshots of Fireburst found on XBLA are nothing like the actual graphics, so don’t deceived. Would I recommend this game to anyone for 800 Microsoft points? I don’t know, the entertainment value really depends on how easily irritated you become by failing constantly and the minuet, yet numerous bugs you may encounter. I suggest you download the trial and see if this is the type of thing you enjoy. It’s hard to be critical of a low-budget arcade game, but this game unfortunately does not provide much entertainment. Dan received his humble roots from a small town just outside of Minneapolis. He is currently attending the University of Wisconsin-Madison to receive his undergrad. He has been an avid gamer and collector since the N64's release in 1996. When he is not playing video games, he enjoys socializing with friends and taking naps by the fire.